Kimchi Dumplings - Spice up your dumplings by adding kimchi to make juicy, plump and delicious dumplings that you just can't stop eating!! I love all sorts of dumplings: boiled, steamed, and pot stickers. Just about any dumplings would make my stomach happy. Last week, I was craving for some dumplings and decided to make some kimchi dumplings, using the leftover kimchi in my fridge. Oh boy, what a great combination by combining the traditional filling (I used ground pork) with kimchi and Korean sweet potato noodles. The dumplings were delicious as always, but with a tint of spiciness from the kimchi…so scrumptious, addictive and I couldn’t stop eating them. For the dumplings, I made them potstickers style. First, I make the dumplings using store-bought dumpling wrappers and then slowly fill each wrapper with the filling, then fold and pleat them into the beautiful shape you see on the pictures here. Kimchi dumplings are super delicious and the recipe is easy to follow. 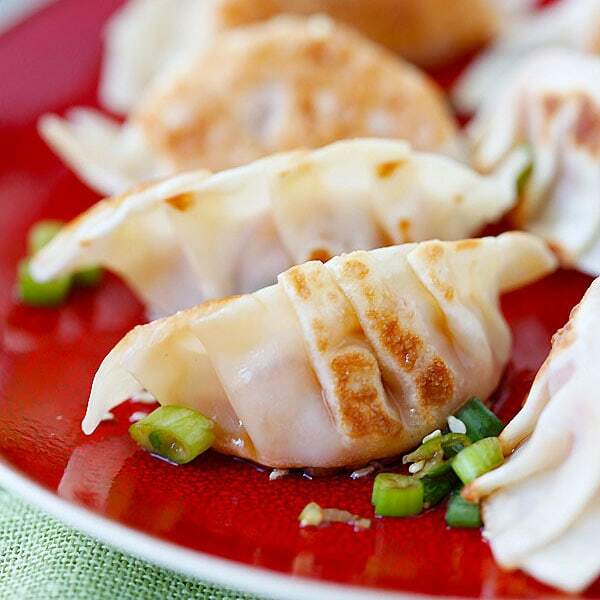 Add some Korean flavors into your regular dumplings and enjoy! Cook the sweet potato noodles by following the packaging instructions. Once cooked, rinse with cold water, drained, pat dry with paper towels and roughly chopped them into short strands. Make the Dipping Sauce by combining all ingredients together in a small dip bowl. Set aside. Combine the chopped sweet potato noodles with the rest of the Filling ingredients. Stir to combine well until the filling becomes sticky and all mixed together. To assemble the dumplings, place a piece of the wrapper on your palm and spoon 1/2 heaping tablespoon of the filling onto the center of the wrapper. Do not overfill. Dip your index finger into a small boil of water and moisten the outer edges of the wrapper. 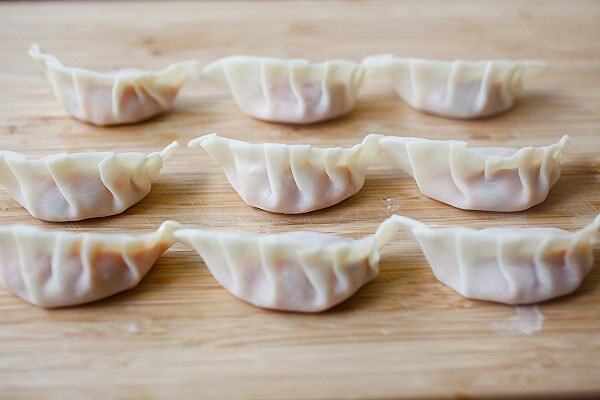 Fold the dumpling to form a half-moon shape and then pinch to from about 5-6 pleats. Press and seal tightly. Arrange the wrapped dumplings on a plate lined with parchment paper to avoid the dumpling from sticking to the bottom of the plate. Repeat the steps above until the filling is used up. Heat some oil in a small skillet or pan over low to medium heat. Arrange 8 dumplings on the skillet or pan. Pan-fry the dumplings until the bottom turns light brown, about 2 to 3 minutes. Turn over and pan-fry the other side until light brown. Cover the skillet or pan with its lid while cooking. Repeat the same until all dumplings are cooked. Serve the dumplings warm with the Dipping Sauce. All photos and recipes on Rasa Malaysia are copyright protected. Please do not use the photos and recipes without prior written permission. If you wish to republish this recipe, please rewrite the recipe in your own words instead of copy and paste and link back to //rasamalaysia.com/kimchi-dumplings/. Thank you very much! You can buy kimchi in the bottle and use about two oz of the kimchi. …are these dumplings like the ones you usually but at a restaurant because I see you have a few recipes? 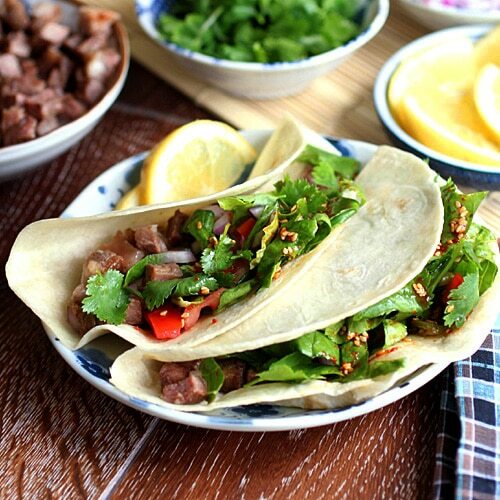 I have many dumplings recipe, all of them are pretty similar but different fillings. You can try this kimchi dumplings recipe. Thanks for sharing. It looks delicious. I can’t wait to try it. Wow! Dumplings are also my favorite since forever. However, kimchi dumplings are new to me. Can’t wait to make it! It must be delicious. Thank you very much for the recipe. Hi hi, so coincidental! I made kimchi wontons last week, and saved a few for pot-sticker style. I like them too and thought the kimchi flavored the fillings really well. 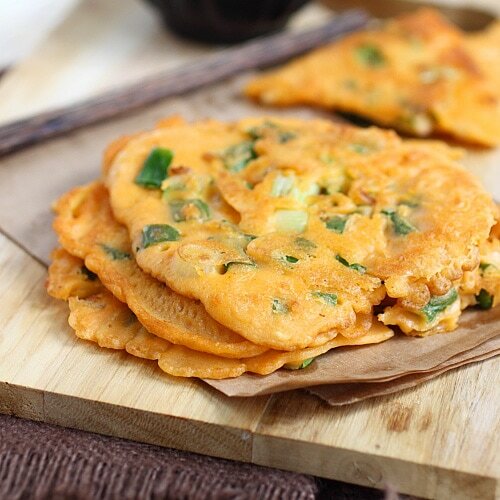 I’m Korean and love seeing Korean food recipes on the web! And I love that kimchi is gaining so much popularity! love these dumplings! Are you able to make these but vegan, preferably with a main ingredient that goes well with espresso? Hi.can’t wait to try this! Having trouble getting sweet potato noodles. Is there a substitute? The first time I made these I didn’t have the sweet potatoe noddles and the dumplings were still delicious! This time I put the sweet potato noddles in but used ground beef instead of ground pork. Mistake! Use the ground pork and leave out the potato noddles! Did you have too much sweet potato noodles? Were they cooked properly? They add texture to the filling but you may or may not like it. Can I steam them instead of frying them? I love dumplings so much. My wife said she would try to this recipe. Thank you for your idea. By the way ,we also love your blog. Amazing. It looks delicious. I can’t wait to try it. Wow….. I just love dumplings. The recipe is really cool. I will definitely try this at home. Hope everybody gonna love this. Thanks a lot for sharing such a recipe. 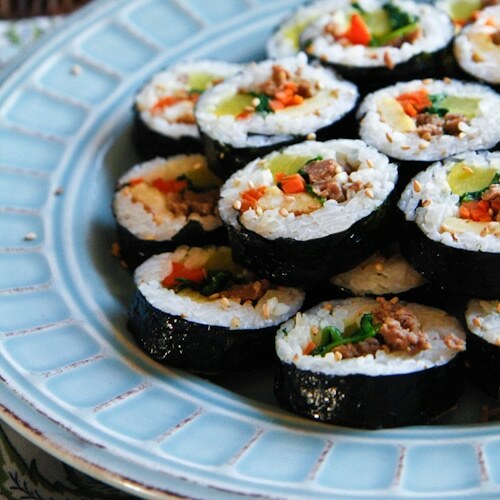 Amazing, are you going to do more Kimchi dishes? Also – What camera are you using for your shots?? I love kimchi and I hope to do more kimchi recipes. Is this Chinese food? Very similar to what I ate in the north of China last year. I tried to cook when back home but it’s so hard you know. This is Korean version of Chinese dumplings. I’ll have to try it soon. After seeing those pictures, my mouth getting watered..
Really Really……. I just love dumplings. The recipe is really good. I will definitely try this at home. Hope everybody gonna love this. Thanks for sharing a good recipe. I’ll have to try it soon. because I really love Kimchi. Ive made these twice and it is a fantastic recipe. Easy and delicious. Yummy, best post on food, enjoying on this post thank you. Yummy and testy post and food too, thank you such a nice sharing. Lol, print out the kimchi dumplings recipe for him. This is a very nice post. It is also very helpful for us. I have been searching this types of the recipe article because I need a recipe information. I am collecting various recipe information. Some days ago I read an article about Kimchi Dumplings, but this post is better than post. Hi, love your yummy recipes. My wife loves your cooking style & me too. Thanks for sharing this recipe.